Under the provisions of the Brisbane City Plan 2014, certain buildings that are constructed in 1946 or earlier – including corner shops, offices and others utilised for commercial purposes – are subject to the Commercial Character Building Overlay where they contribute to the distinctive architectural character of the City and should be preserved. Accordingly, they are afforded a similar level of protection under the City Plan 2014 as dwelling houses constructed prior to 1946 within the Traditional Building Character Overlay. Whilst some may consider the typical commercial character building as outdated, such buildings offer a number of opportunities to the astute business operator. The overlay provides for a broad range of non-residential uses such as shops, offices and health care services (e.g. dental clinic) even within residential areas and outside designated shopping centre zones. In many instances, a development application for the use is not required, saving considerable time and costs for anyone running or starting a business. 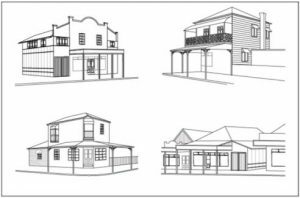 What are Commercial Character Buildings? Originally designed for residential uses with traditional residential setbacks and materials and may be adapted and utilised for other uses. What are Commercial Character Building Activities? We recently received an enquiry from a client seeking to relocate a small-scale dental clinic to avoid the prohibitive costs of renting in an existing commercial complex. The client provided us two potential sites to consider. Site 1 appeared to be a good fit on face value. It contained an existing house that could be refurbished, was located on a major road which would maximise business exposure, had secondary street access for future customer parking, and was close to existing similar health care services and commercial uses within the Centres Zone category. The site however, was not identified within the Commercial Character Building Overlay. Accordingly, the use would be subject to an Impact Assessable Development application. Site 2 contained an existing shop identified within the Commercial Character Building Overlay. Despite also being located on a major road and outside of an existing centre, a new dental clinic within the existing building could be established without the need for a development application. Commercial character buildings are often under-appreciated gems with excellent utility value, flexibility and opportunity to avoid time and costs of development applications! 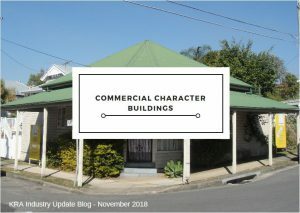 For more information or if you have specific questions about potential use or development of a commercial character building, contact us on (07) 3876 0533.